Harvard’s Nikki Okwelogu may have shared this honor last year, but she stands alone with it this time around. She continued to dominate the shot put in the Ivy League, winning that event at both the Indoor and Outdoor Heps Championships. She won a third Heps title with the discus throw at Outdoor Heps in a new meet record distance of 180-06, helping her earn the Outdoor Heps Field MVP award. “It has been the year of great victories for Okwelogu. Early into the indoor season, Okwelogu set a new personal best in the shot put with a distance of 57-11.25. This momentum continued to the outdoor season where she won the NCAA East Regional title in Jacksonville, FL., with a mark of 58-9.25, which stands as a new lifetime best and as an Olympic Games qualifying mark. During the 2016 Indoor and Outdoor NCAA Championships, she collected two All-American statuses in the shot put, she finished third indoors and eighth outdoors. She just missed First-Team honors in the discus throw, where she finished 10th at the NCAA Outdoor Championships. 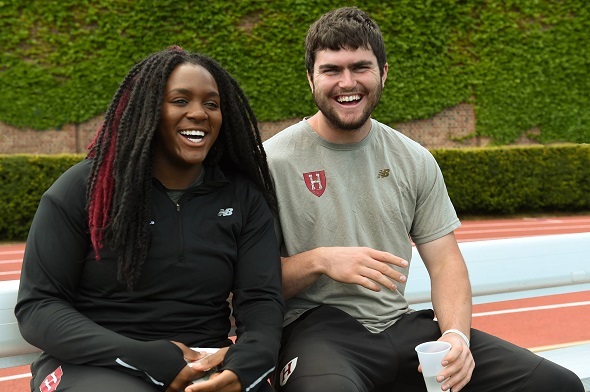 At the 2016 African Championships in Durban, South Africa, Okwelogu won the discus event with a measured mark of 186-2.25, besting the field by more than three feet and a new personal best (it is also the best ever by an Ivy Leaguer). This gold medal joins the silver that she previously won in this event in 2014. In the shot put, she tossed a 56-0 throw to claim silver, improving from her fourth place finish in 2014. To date, Okwelogu has demolished Harvard’s indoor all-time performance record by nearly eight feet and shattered a 25-year-old outdoor shot put record by over ten feet. She simply thought her hard work was finally paying off. What she didn’t know was that she would be headed to Rio to represent Nigeria (the birthplace of her parents) at the 2016 Summer Olympic Games— a dream she regarded intangible. Kaitlin Whitehorn (Dartmouth) – the Ivy League has such a rich history in the high jump, and Whitehorn is now among that elite. She won a total of six high jump titles (three indoors/three outdoors), in addition to claiming a 100m dash title back in 2014. But Whitehorn has soared to new heights in her final collegiate seasons as she earned two First-Team All-American honors in the high jump – 7th in indoors; tied for 3rd in outdoors – and cleared 6-feet for the first time at the Olympic Trials, where she finished fifth with a 6-02 ¼ clearance. Allison Harris (Princeton) – Harris has also soared to new heights in 2016. She now holds both pole vault conference records (13-07 ¼ for both indoors and outdoors), as well as the pole vault conference titles. Her 2016 winning heights are meet records (13-07 ¼ indoors; 13-01 ½ for outdoors, which she shares with two other vaulters – Cornell’s Natatlie Gengel and Princeton’s Tory Worthen). For resetting the Indoor Heps meet record, Harris was given the Indoor Heps Field MVP award. This entry was posted on Saturday, December 31st, 2016 at 8:00 am. It is filed under Athletes, Awards, Spotlight. You can follow any responses to this entry through the RSS 2.0 feed.